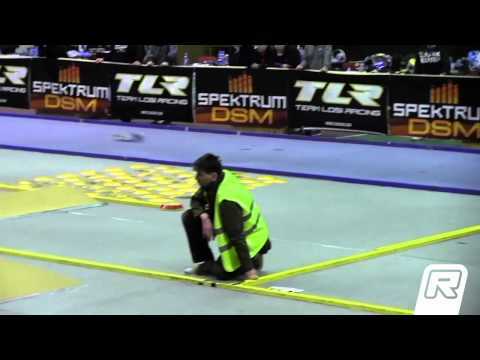 Top Qualifier Joern Neumann has won the opening 2WD Buggy A-Main at Round 1 of the TLR/Spektrum Euro Offroad Series in the Czech Republic this morning but two mistakes meant the Team Durango star had to work for the expected win. The German looked to have been given an easy passage to victory on the opening lap when team-mate Hupo Honigl, who started second, put his DEX210 on its roof but two laps later a mistake on the landing off the table top saw Neumann also end up on his roof. While he held on to the lead the Reedy Race winner now had a trio of TLR drivers right on his rear wing. Mounting the most serious challenge was Oskar Levin but the talented young Swede was also to make errors that dropped him to fourth. In the end it was a very steady drive by Portugal’s Miguel Matias that saw him take second ahead of Team Losi Racing team-mate Mike Truhe. 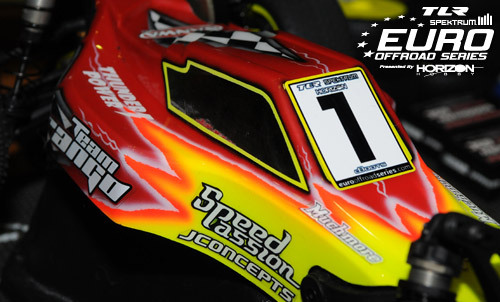 Joern Neumann will carry the No.1 starting number on both his buggies in tomorrow’s A-Mains at the Euro Offroad Series opener in the Czech Republic after the German ace completed the double in buggy qualifying. 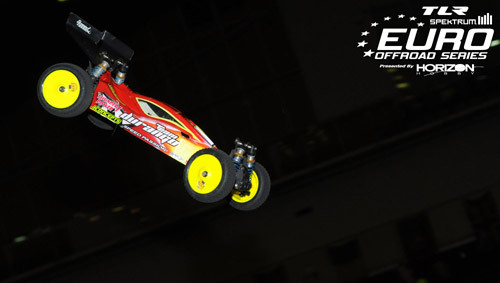 Having secured overall TQ honours in 2WD Buggy from Durango team-mate Hupo Hönigl, the European Champion went on to put in his fastest run of the weekend in the closing heat of the day to be crowned Top Qualifier again from his Austrian team-mate. Having produced the fastest overall time of the five rounds of qualifying when he TQ’d Q2, Honigl will be hoping he can challenge his, very much on form, younger team-mate over tomorrow’s 3 leg finals but with Neumann still on a high from becoming the first European to win the Reedy International Race of Champions, he will have his work cut out. 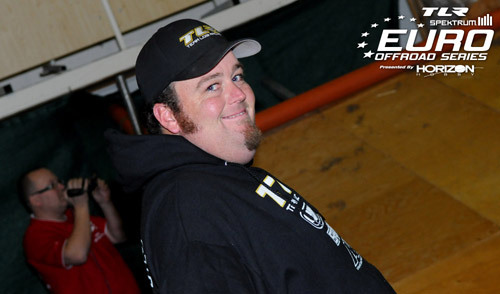 Neumann was always expected to rule proceedings in 4WD Buggy this weekend especially as the other full factory squad here this weekend, TLR, are using a buggy that hit the market two decades ago. 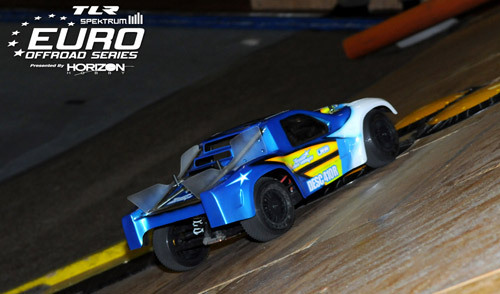 Despite the age of the his car European Horizon Hobby backed driver Oskar Levin is again the best non-Durango driver with his XX4 set to start 3rd on the grid in front of the XXX4 of former 1:8 Offroad European Champion and World finalist Miguel Matias. 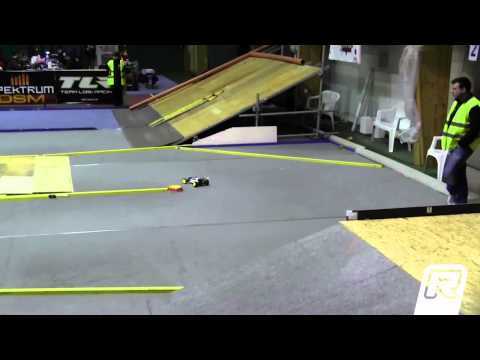 Knowing that they have little chance of going for the win the TLR pair are focused on their own private battle for the final spot on the podium but will need to be careful of promising local 15-year-old Kája Novotny whose Durango DEX410 starts fifth in front of the Tamiya of Swedish Champion Otto Ausfelt. In 4WD Short Course there was further success for the Team Durango squad with Hönigl declared the Top Qualifier over Neumann after the pair tied on points. Mike Truhe’s Losi Ten-SCTE will line up third. 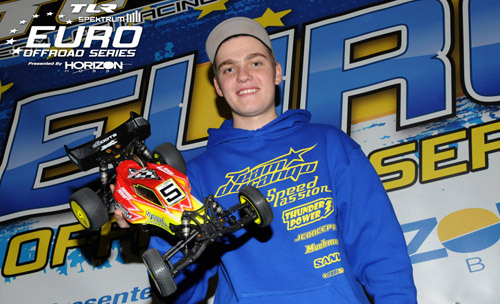 Joern Neumann is the 2WD Buggy Top Qualifier for the opening round of the TLR/Spektrum Euro Offroad Series after the German secured his third TQ run of the day in the fifth & final round of qualifying in the Czech Republic. The Team Durango driver went into the last qualifier with only team-mate Hupo Honigl in a position to deny him the No.1 starting position but the Austrian rolled onto his roof on the opening lap bringing a very premature end to that challenge. Instead Neumann came under pressure early in the 5-minute heat from TLR’s Mike Truhe. 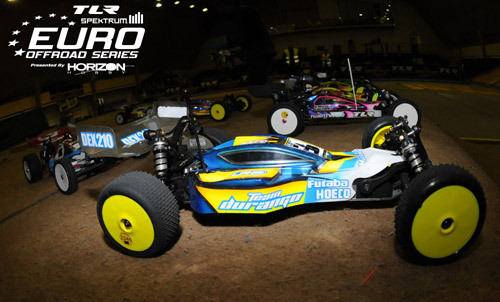 The TLR star’s first experience of racing a buggy on carpet, the American’s confidence on what is an alien surface to the former US Champion has grown with each run and in Q5 we saw for the first time that Durango may not have it 100% their own way in tomorrow’s A-Main. A mistake on his penultimate lap saw Truhe drop to third on the time sheets behind fellow TLR22 driver Oskar Levin, a result that also means he lines up on the grid in fourth position behind the 17-year-old Swedish Champion who is the highest starting non-Durango driver. Having held third in the qualification ranking for much of the day the 6th fastest time in the final two qualifiers drops TLR’s Miguel Matias to fifth on the grid. 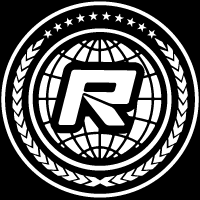 Securing second the grid, Honigl said after his roll two corners into the start of Q5 that he reverted to using the run to scrub in his new set of dBoots for the finals, pulling up his LRP powered DEX210 once the controlled tyres started to come in. Able to run a very similar fastest lap time to Neumann during the round Honigl said he is confident he can give his team-mate a good run for his money tomorrow. 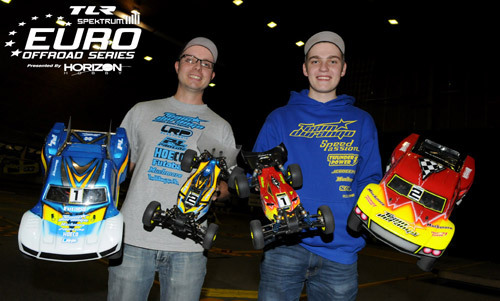 Team Durango’s Joern Neumann and Hupo Honigl remain in control of qualifying for the opening round of the inaugural TLR/Spektrum Euro Offroad Series with the duo sharing the honour of topping the time sheets for all of the buggy qualifiers. After 3 of the five rounds of heats, of which two will count towards tomorrow’s grid positions, Neumann has two TQ runs in both 2WD & 4WD Buggy while Honigl has a maximum score in each along with a hat trick of fastest runs in 4WD Short Course. Holding the fastest lap for both buggy classes, Neumann is clearly the man to beat here in Hrotovice but the German has made some big driver errors which have benefited Honigl who took Q2 in 4WD and Q3 in 2WD. 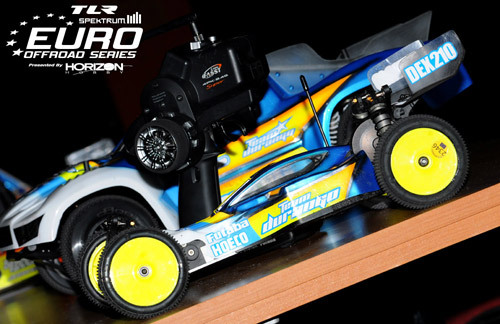 Behind the Durango squad it is Miguel Matias who is best of the rest with the Team Losi Racing driver holding 3rd in the qualification rankings for both classes. 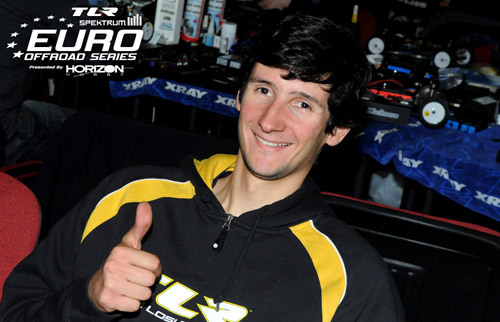 Better known for his 1:8 Offroad achievements, the Portuguese driver who has only recently made a return to electric offroad after a 10 year absence has just recorded his best round of 2WD taking his TLR22 to the second fastest time just short of a 14 lap run. 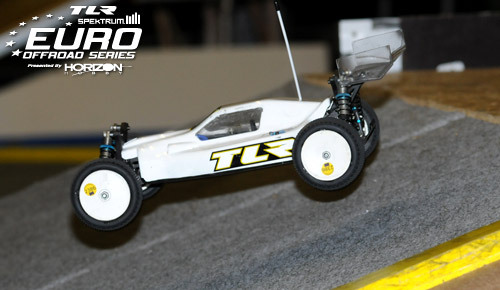 Overall Q3 marked an improvement from the TLR squad with American ace Mike Truhe clocking his fastest run improving his previous best time by over 5.5 seconds.